OK, OK... I know I made a bit of a song and a dance a while back about Strats being "the most boring guitar" on the planet (or something). Perhaps I was in denial? Perhaps I just wanted a change? Perhaps I was just a bit pissed off because a couple of years ago I needed the cash and had to sell my japanese 70s style paisley pink Stratocaster. 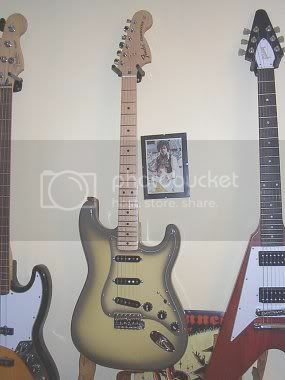 This new Antigua finish 70s style Strat is lovely, and I think I like the finish more than I liked my paisley Strat. Once again, it's a japanese Strat and it plays and feels just like my old paisley jobbie. Playing this guitar feels like resuming a relationship with an old friend, and I'm beginning to understand now just why the Stratocaster this year celebrated its 50th Anniversary. The guitar is so popular simply because it is a classic piece of design work. I mean, I love my Gibson Flying V but it's not exactly comfortable or convenient to play in a sitting position. The Stratocaster's curves and contours are ergonomically designed to fit to the player's body. It is a superb piece of design. For me it had to be a 70s style Strat, no other Strat would do. This is partially because I wanted a replacment for my old paisley Strat (the recent paisley reissues are not 70s style), and partly because I like the big headstock and the neck profile. Don't ask me why, it's just what I'm comfortable with, both visually and in use. These limited edition Antigua re-issues (there's also a Telecaster and a very limited Jaguar available) have been created exclusively for the European market. I got mine for a very nice price all the way from Germany. For more info see www.fendereurope.com. JDX Direct Box for Guitar: works with any guitar amp head. South Park creators team up with Epiphone to launch new action film... and wasn't South Park itself sponsored by Fender? Dare you store your guitar away in a Coffin Case? Minarik Guitars: makers of the Inferno guitar with a somewhat firey bodyshape. Singer in appeal for antique guitar's return: Willy Mason is offering a reward for the return of his 70s Gibson Hummingbird, which was recently stolen at a gig in Newcastle. Police on the track of £3,000 guitar: thief walks out of Coventry music shop wih the most expensive guitar in stock. Optek Launches FG-400 Series Fretlight Guitars: See songs light up underneath your fingertips! Line 6 announce the Variax Bass, the world's first modelling bass. Spanish guitars made from banned wood: Police in Spain have uncovered an illegal network engaged in smuggling protected wood from Brazilian rain forests to be fashioned into high-quality guitars. Win the NEW Fender Cyber-Twin SE!! US entrants only. Another Guitar Blog! And there's this one too which appears to be a photo blog of sorts. A Conversation With Doug Fieger Of The Knack from the Epiphone Musical Instruments website. All Things Guitar: It used to be All Things Strat but it looks like they've branched out! Scotty Moore: The Official Website. There's a nice section on the guitars used by Scotty and Elvis. McCartney guitar auctioned: A replica of the guitar Paul McCartney wrote "Yesterday" on is being auctioned. The Return of the 12-string Stratocaster: back (in Europe, at least) by popular demand! Famous Guitarists Perform at Fender Show: celebrating the 50th Anniversary of the Fender Stratocaster at Wembley Arena. New Guns N' Roses Guitarist? : Does anyone care any more? Radiohead Donates Guitar to Homeless Charity: I wish they'd donate ALL their instruments to charity and stop making such hideous dirge-like music. Six String Arts, the art of the guitar in stunning miniature reproductions: check out these ultra-detailed models of guitars as owned by Jimi Hendrix, Stevie Ray Vaughan, the Beatles, Jimmy Page, Eric Clapton, Kurt Cobain and many others. Fender Jazzmaster and Jaguar - the higher evolution of off-set waist guitars: A tribute to Fender's Jazzmaster and Jaguar guitars.